Sponsors Biodiesel and SVO Forums Home Forums Biodiesel Methanol Recovery Alcohol Hydrometers give false purity. Here are the pics. Alcohol Hydrometers give false purity. Here are the pics. First off, I am not sure why this subject consistently evokes such a knee jerk emotional response from people over various message boards in both the US and the UK. However I am posting pictures to hopefully put this conversation in its proper place. Winemaker/Beer Alcohol hydrometers over-report the purity of methanol. A quick story to how I ‘discovered this’. • 3 years ago I was a total knob. • For my first processor – I tackled building Graham Lamings Push/Pull rector with methanol recovery unit. At the time, I had no idea it was merely an engineering sketch and not a working unit. Turned out - I was way in over my head in all respects, and nothing worked as it should. Luckily I didn't get injured or burn anything down. • Depressed but undaunted, to unravel my mess, I began to measure things to see what was failing. • After reading many posts and consulting with some real experts, it seemed like maybe I had too much water in the reaction. (more about this another post at a later date). Of course as a total knob, I looked for someone to blame. I was buying racing fuel methanol, and suspected the guy selling to me was cutting the fuel with water! So a friend lent me his alcohol hyrdrometer and low and behold, I found out I was dead wrong. I didn’t have bad methanol, I had the best money could buy! 105% Wooohoo! • So I broke down and bought one of these highly accurate light hyrdrometers from Utah biodiesel. • The two hydrometers definitely give two different results. See the pictures below. Before we start, I used this "Hydrometer Temperature Adjustment sheet" to lookup the percentage of methanol. I first started by calibrating the Universal alcohol hydrometer. See how it’s off about .015? Water should be 1.00. For simplicity sake, lets add .02 to all its measurements to compensate for its off weight. Even if I am overcompensating the extra .005, it will cause the Universal hydrometer results to be even closer to the “light hyrdrometer” results. Now look at the two pictures directly below. In the pure methanol, you can't even get an accurate reading with the Brewers Tralles. In the recovered methanol, the results give a 3% difference. Seems like not a big deal. But after recovering only 5 gallons of Methanol, you would have an extra 1.2 pints of water contaminating your methanol that you wouldn’t know about. Math is below the two pictures for your review. 96% purity* 5gallons = 4.8 gallons of methanol. That means in 5 gallons, you already have .2 gallons of water which translates into about 1.6 pints of water in your recovered methanol. But if your real purity was 93%, then you really have 2.8 pints of water, 75% more water! I am guessing the reason why these two hydrometers give such different results is their scale of sensitivity. Looking at the scale pictures, you can see that the universal hyrdrometer from its .700 to .800 is only about an 1.5 inches long. On the light hydrometer, its about 5.5 inches long. One note about water. People are using recovered methanol to make biodiesel. Water does effect the biodiesel reaction, but as far as I can tell, nobody has done a clear study on how much it does. I also even read an article awhile back about ‘aqueous solution for methoxide” - something to that nature. It discussed the possibility of using water to dissolve the catalyst first, then add that to the methanol, but the article was chemically a little above my head and I never saw any follow up to it. I think it the article was posted by Tilly. Anyway. I hope these pictures clear up some misconceptions. Please comment, but do try to keep it civil. Interesting subject. The hydrometer I have has a % scale. When I first used it in recovered methanol I thought it could be a little optimistic. So I checked it with "new" methanol, and it read a little above 100%.I did not correct for temperature. Close enough for a farmer. Recovered methanol in photo. I don't always get it this good. This is not a Wine/Beer Alcohol hydrometer. Is this what you have been calling a Tralles hydrometer and a brewers hydrometer in that other thread? It is neither!!! It is just a cheap, inaccurate hydrometer. Go spend more than $2 and buy an Alcoholmeter Tralles like fuelfarmer has. To which I say: Go spend another $10 and buy yourself a Hyrdrometer with a proper SG scale (.700 to .810) for measuring near pure alcohol. Again as I said in the first sentence of this post. Not sure why this topic agitates people so. My only point in all of this is that in recovering methanol, over time you WILL be accumulating more water by volume as you store the recovered methanol. Even more water than you might be aware if you are not using a very accurate hydrometer. Therefore if you later have a failed biodeisel reaction and you are using recovered methanol, ONE POSSIBLE CAUSE COULD be an over accumulation of water. What more is there to say about this? Dr. Dixieland, you so vehemently claim to be a person who will point out inaccuracies, but I struggle to comprehend why you would defend the use of a Brewers Tralles which may over-report alcohol purity when there is another instrument, that will very accurately report it. Please I ask you pick a side. Are you for eliminating inaccuracies or for defending the Brewers Tralles that MIGHT not introduce too much error? [quote]To which I say: Go spend another $10 and buy yourself a Hyrdrometer with a proper SG scale (.700 to .810) for measuring near pure alcohol. Yes, I was looking at your hydrometer and thinking "What a poor choice of scales for measuring a liquid that will have an SG of around 0.791 or a bit more." You will never use the part of your hydrometer from 0.700 to 0.780 measuring methanol. Have you notice that you are always taking your readings down around the bulb of the hydrometer where the divisions are the closest together and the hydrometer is the least accurate? An SG scale of 0.750- 0.850 or even 0.760 to 0.830 would be much more appropriate. In this instance it was because you did not demonstrate or test for what you said you did. All you showed was that your original hydrometer was inaccurate. It was not a brewers hydrometer or a distillers hydrometer. My only point in all of this is that in recovering methanol, over time you WILL be accumulating more water by volume as you store the recovered methanol. No you don't. The water does not separate out in the barrel, it remains mixed with the methanol. If you are taking 98% purity methanol in and out of the barrel, the methanol in the barrel will always be 98% purity. Therefore if you later have a failed biodeisel reaction and you are using recovered methanol, ONE POSSIBLE CAUSE COULD be an over accumulation of water. Sorry, it does not work that way. Water does not settle out of the methanol to the bottom of the barrel. I think it has all been said. Dr. Dixieland, you so vehemently claim to be a person who will point out inaccuracies, but I struggle to comprehend why you would defend the use of a Brewers Tralles which may over-report alcohol purity when there is another instrument, that will very accurately report it. I do not recall vehemently claiming to be a person who will point out inaccuracies. I will point out for at least the third time that An alcoholmeter tralles will read SLIGHTLY LOW, not high as you keep claiming. Please I ask you pick a side. I have, please be accurate in what you write. Are you for eliminating inaccuracies or for defending the Brewers Tralles that MIGHT not introduce too much error? Can you please understand that brewers do not use Tralles hydrometers, distillers do. I personally think Doug did a good job of pointing out that hydrometers are not the most accurate instuments in the world for measuring methanol content. There actually are some very precise machines that do a really good job, they just cost thousands of dollars. There seems to be a lot of anger in this thread. How about a "Time Out" fellas? I still not sure why you are so combative, as opposed to an open discussion. I have a great many theories, but none which I think it appropriate to in an open forum. This would be a lot more fun for everybody, if you were just a little less emphatic and I feel condecending towards me. 1) As for water separating from the methanol, I am not sure what made you think I was making that point. Methanol and water do not separate. b) Keep the recovered methanol in a separate container and keep adding to that. • 2 Gallons of methanol recovered each time. • The quality of the methanol made no impact on the recovery of methanol. You still got back 93% pure methanol each time. (this is very questionable, but it gives a best case scenario). CASE OF JUST ACCUMULATING RECOVERED METH. The important part here I would contend is not the 93%, but that if you only used the 6 gallons in the recovered to make your next batch, you would be adding in nearly half a gallon of water. I think this could really mess up a 40 gallon reaction. * But maybe not. Anybody want to just try it and see. Use 5.5 gallon of pure meth and add 1/2 gallon of water to their methoxide. Maybe there will be no impact. Let use know. A hydrometer that measures alcohol percent direct. What will they think of next? I had to have one. Yesterday after the service, I stopped at the home brew shop across from church and told them I wanted a brewers tralles. The fellow said do you mean a alcoholmeter tralles and I said Whatever. He had several different ones. Now I have two, a short one and a long one. The long one also has a proof scale. When I got home the first thing I did was look at them both real close. From top to bottom the scales on both of them goes from 100 to 0 with a number written in every 10th division and a line for the ones in between. The proof scale goes from 200 to 0. The distance between the divisions is very small at the 0 near the bottom bulb and gets progressively wider going to 100 at the top. Next I got some water out of the rain barrel and floated them both in it at 60 f. They both sit a tad high, maybe 1% or 2%. It is hard to tell because there are no divisions below 0 and the divisions are so close together down there. Besides, I did not buy them to measure water, I bought them to measure methanol. As luck would have it I had a brand new un-open 55 of methanol out back. So, using my best hygiene practice, I opened the drum and siphoned out some methanol for testing. After making sure the methanol was at 60f I found that the small alcoholmeter reads just at 100. The large one read about 99.4, just a tad under 199 proof. In my book that is pretty neat. Winemaker/Beer Alcohol hydrometers are not capable of reporting the purity of methanol and only indirectly do they report the strength of beer and wine. Neither one of the hydrometers in the photos above is a Winemakers/ Beer Brewers hydrometer. If you are interested it is easy enough to find out more about how Winemakers and Beer Brewers use brewing hydrometers to determine the percent of alcohol in the wine and beer they produce. I would like to take a few minutes to comment on the photos you have posted and correct hydrometer procedure. You need to insure the hydrometers are spotlessly clean. When you place the hydrometer in the liquid you should give it a good spin/twirl to remove any air bubbles. Allow the hydrometer to find it's own depth. The hydrometer must not touch anything other than the liquid it is floating in. If the hydrometer is touching anything this will make the reading meaningless. Every photo above seems to show one or both hydrometer touching something, such as the other hydrometer or the side of the cylinder. I am afraid that the hydrometer readings you have shown can not be considered to be accurate. Excellent points. I took about 75 photos to get the few you see for the reasons you list: no touching, and let the hydrometers settle - (also to get the darn scales to face the camera.) In all of the CU pictures, the hydrometers are not touching the sides or each other. The wide shot was just an illustration of the setup. If the hydrometer thingy stabilizes, and then drifts over into the side of the beaker without the reading changing, that is close enough for me. It does take some time and luck to get a good photo. I personally think Doug did a good job of pointing out that hydrometers are not the most accurate instuments in the world for measuring methanol content. I did not think that was what Doug was trying to show. I seems that Doug was trying to show that all Winemaker and Beer hydrometers overstate the purity of methanol by using another hydrometer as his refrence. Now we know that Winemaker and beer hydrometers can not even measure the purity of methanol. It appears Doug was loaned a hydrometer that was not particularly accurate. Maybe it had been dropped and the paper with the scale printed on it had slipped inside the glass tube or maybe it was just poorly made. The bottom line is that just because Doug got ahold of one inaccurate hydrometer you can not assume all hydrometers are equally inaccurate. There actually are some very precise machines that do a really good job, they just cost thousands of dollars. If you know that the liquid in question is composed exclusively of pure water and methanol such as out of a still, then a hydrometer can tell you very precisely how much of the liquid is Alcohol. While I can not find the accuracy of the specific hydrometer you have linked to, I have found a similar one Here that lists it's accuracy at ± 0.0005; one division on it's scale. If I am not mistaken, this gives it an accuracy of about one sixth of one percent methanol. That is not bad for $22, and I doubt that greater accuracy is required in our hobby. That link is a good hydrometer. I wish I had known about it before I bought mine 3 years ago as I would really like to measure up to .830. 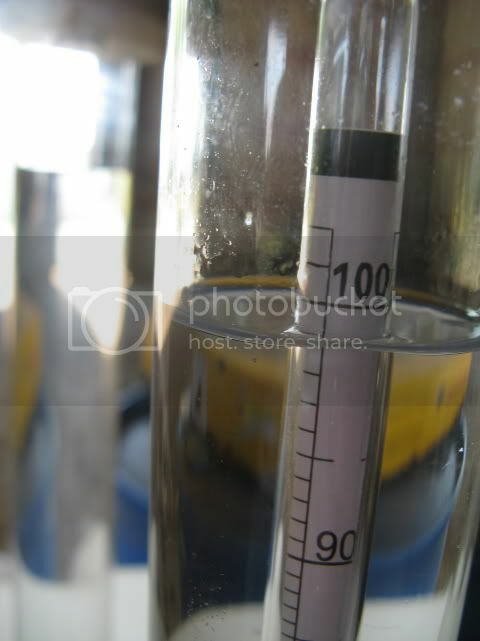 If someone wanted to lend me another hydrometer, I would be happy to test that out as well and snap some more photos. Also if someone who owns one of the other hydrometers and bought the one you or Rick linked to, and did a similar experiment as I did, that would be great as well. From what I observed in my 2 years or recovering methanol and what some experts have told me about the maximum purity you can obtain and what I read in FuelFarmer's post and many others like his is that without a fine scale hydrometer, measurements will be off - on the high side. Its just like trying to weigh 1 gram on a scale that has a sensitivity that goes from 1g to 1000g. You just will never know if its .8g or 1.2g. That is not bad for $22, and I doubt that greater accuracy is required in our hobby. Actually for making biodiesel, all we need is to be within a couple of a percent. That's good enougn to tell us if we can use the methanol as is or try something different. This exercise in hyper accuracy is all fine and dandy for an academic exercise, but definately not required to make high quality backyard (or back 40) biodiesel. Yes, it is a shame that you bought a hydrometer that was not really suitable for methanol recovery. From what I observed in my 2 years or recovering methanol and what some experts have told me about the maximum purity you can obtain and what I read in FuelFarmer's post and many others like his is that without a fine scale hydrometer, measurements will be off - on the high side. All hydrometers are built to a specific accuracy and that is usually stated as "Plus or minus" A hydrometer is just as likely to read low as high. What have the experts advised about the maximum purity you can obtain? Its just like trying to weigh 1 gram on a scale that has a sensitivity that goes from 1g to 1000g. You just will never know if its .8g or 1.2g. I agree, your first hydrometer was not really appropriate for the job you wanted it to do, even if it had been accurate. I am sure you are right that since my .7 to .81 hydrometer has a range of .11 and the HB hydrometer you list (.76 to .83) has a range .6 that the HB Hydrometer would indeed be even more accurate. Which is my point exactly about using a hydrometer that has a scale from 1 to .790 (0% to 100%) which has a range of .3 SG (the original one in my test has a a range of 1.3!) Its like trying to measure 1mm with your thumb. It can be done, but people will report back fairly different measurements. If I ever buy one of those HB hydrometers, I will compare it to the .7-.81 I have. As for recovery issues. At a conference held last year, one of the experts I spoke to was Daniel Bowen, the lead chemist and engineer at Springboard Biodiesel, who make the BioPros. At the time, they were prototyping/beta testing a methanol recovery unit and had also built a small scale methanol purifier. He explained the physics and mathmatics of purifying methanol. The issue is called I believe "Partial Pressures" and has to do with how a substance evaporative properties change with the percentage of purity. Long story short, to get above 94% pure, you need a long plate reflux column and a way to accurately maintain the temperature of those plates. Daniel has a graduate degree in physics and is building these for a living. I am not saying he infallible and that there is not a possibility of finding s simpler way to recover pure methanol, all I am saying is that I will wait till someone can repeatedly do it, and use a highly accurate tool to measure their success. One thing I may have missed, is that Methanol, and Ethanol, are 2 different alcohols and have slighty different SG's. Also calibrating with water requires distilled water, that is de-aerated, in other words boiled or allowed to sit and de-gas. The contaminate in the alcohol also will throw the reading. if the contaminate is lighter than water it will give a false high reading. Quick Reply to: Alcohol Hydrometers give false purity. Here are the pics.